This work of historical fiction by award-winning author and former tall ship devotee Maxine Trottier, is an “old school” adventure yarn. 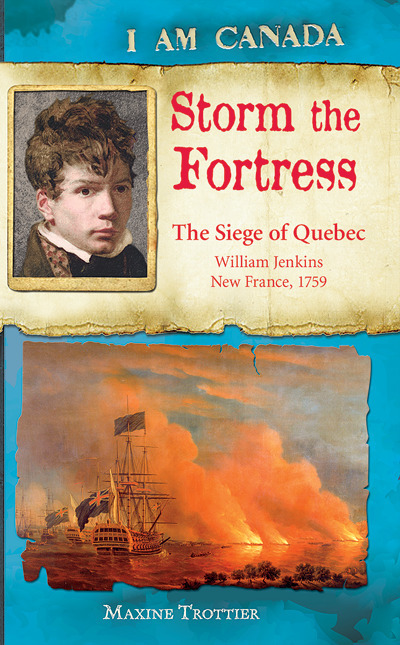 Part of Scholastics “I Am Canada” series, Storm the Fortress tells the story of young British emigrant William Jenkins. From the age of six onward he calls Halifax home, but he also sails throughout the region—from Louisbourg to Quebec—during the tumultuous 1750s. Readers will be treated to elaborate explanations of 18th century military tactics as well as details on how sailing vessels operated back then (naturally there is also the essential spunky animal companion—King Louis—a ratter dog who proves his worth eliminating pests onboard ships). The climax is the battle of Quebec, told from the eyewitness point of view of Jenkins, and the book ends with his subsequent post-war life in the Maritimes. Accompanied by black and white maps and illustrations of important personalities, this book is a treat for the historically-minded of any age. Classroom Connections: This novel would work as a supplemental resource for various provincial intermediate social studies curriculum (in Ontario, for instance, grade 7 studies “New France and British North America, 1713–1800,” in New Brunswick grade 8 examines “Atlantic Canada in the Global Community,” and in BC grade 9 looks at “Society and Culture: Europe and North America from 1500 to 1815”). Storm the Fortress could be used in a variety ways depending on the ages and levels involved (as a read aloud to bring characters like Wolfe and Montcalm alive, as a source for timelines of major events, or as one component of a comparative examination against textbook/ encyclopedia accounts).